Valentine's Day is one of my favorite holidays. 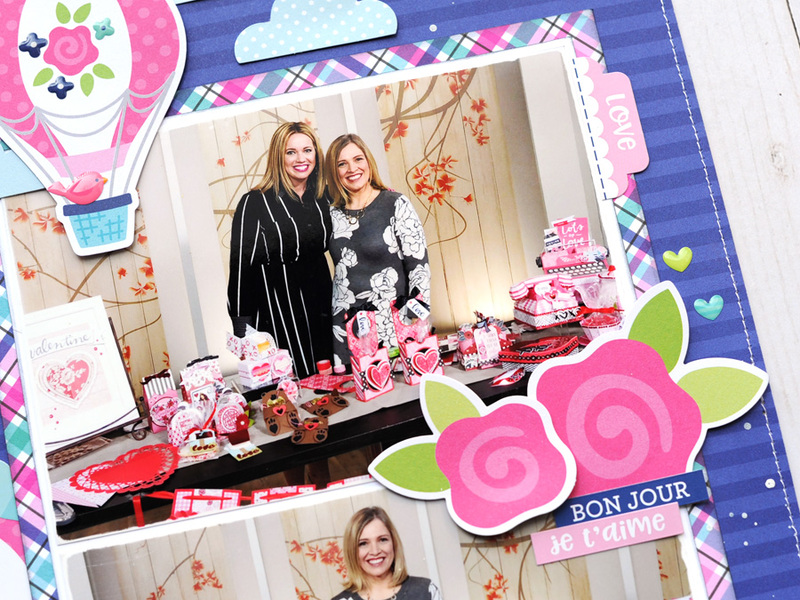 Last year I was invited to come on our local lifestyle television show to talk about papercrafting for Valentine's Day. 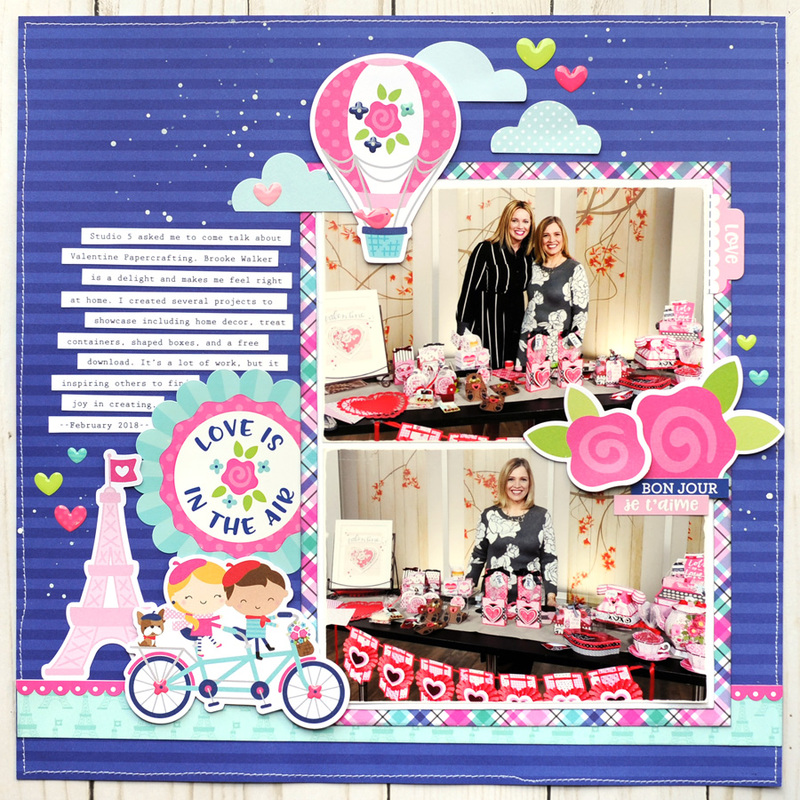 Of course I took photos of my experience, and the French Kiss collection, with it's lovey-dovey vibe, was perfect for scrapbooking about it. I added another adorable scene at the bottom of the layout next to the title sticker. A cute couple on a tandem bicycle are enjoying one another's company as they take a romantic, scenic ride past the Eiffel Tower. I added flower stickers from the French Kiss Shape Sprinkles to add dimension to the bicycle's wheels. Love is definitely in the air! 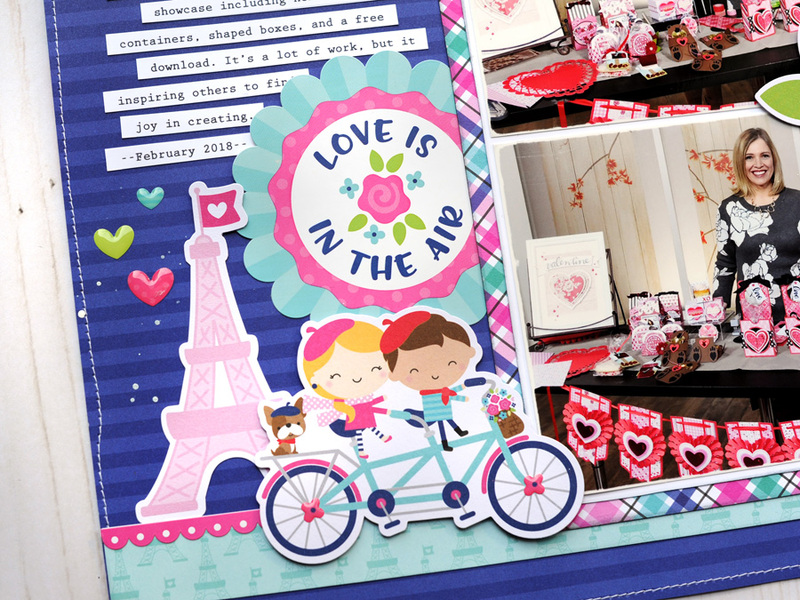 I used the "Love Is In the Air" sticker from the This & That Sticker Sheet as my title. 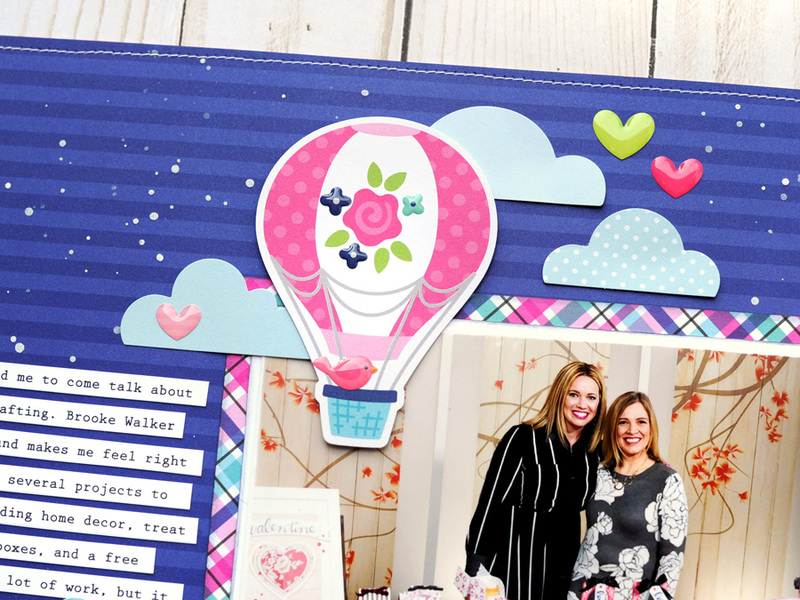 To go along with the title I built a scene at the top of the page including the hot air balloon and several cloud die cuts from the Odds & Ends pack. I added a little bird from the French Kiss Shape Sprinkles to the basket of the hot air balloon, and then added additional flower sprinkles to the balloon for additional detail. The white spray mist droplets make you feel like the hot air balloon is floating through a romantic night sky. I wanted to break up the two photos a bit, so I added flower die cuts from the Odds & Ends pack along with a couple of phrase stickers from the This & That sticker sheet. I also added a couple of the Heart Throb Shape Sprinkles, and a pink tab sticker (This & That stickers) to the top photo. Pretty layering of elements on this cute page. This is such a gorgeous page! I don't think it gets any cuter than this, Jana! Am so wanting this set with the effel tower!! Your layers of bright gorgeous colors and graphs is dreamy!! The Valentines all look so fabulous as well!! Am going to have to search for the Studio 5 show!!!! Thank you for all of the inspiration!